Wow! Such a beautiful medley of flours to make such a delectable thalipeeth! The pictures make it all the more tempting...awesome pick! Love these kind of multigrain rotis or dosas in our weekly meal. Such a healthy and definitely a nutritious thalipeeth to give a try without any hesitation. Bajra and Jowar make rotis quite flavourful. After making dhebra, I have become a great fan of millet based rotis. This thalipeeth looks so delicious and super inviting..
Thalipeeth takes me back to our BM meet when Pradnya gave us packets of the home milled thalipeeth flour . Every time I visit Mumbai I make it a point to eat thalipeeth in a authentic restaurant . 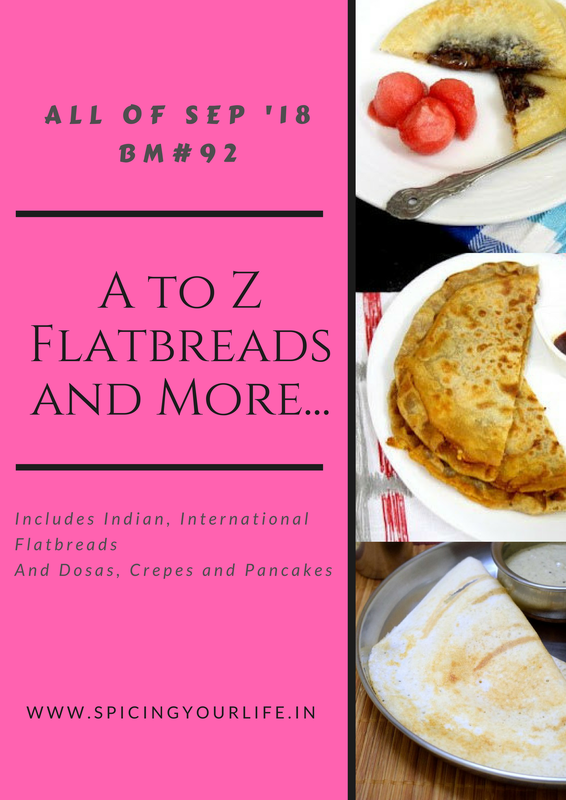 Your thalipeeth has come out so well and it is such a healthy flatbread to indulge in . Dry roasting the flours must have enhanced the flavour , I too should do that with the millet breads . Thalipeeth looks so mouthwatering dear. having all healthy flours definitely makes it a great recipe for breakfast of brunch. Also great idea to include these in kids tiffin. wow.. this thalipeeth looks so tasty and flavorful.. great for breakfast. Love this multigrain thalipeeth, looks so yummy.An ideal flatbread for a healthy breakfast. Your tip of roasting the flours is very useful. I so enjoyed the thalipeeth and made a homemade Bhajani flour..as you said it surely tastes similar to our rottis..very nicely made..fantastic pick! A wonderful combination of flours. The thalipeeth is one of my favorite lunch. Yours looks so crispy and yym. Though I have a mill nearby never even attempted to make thalipeeth though I know how good it tastes! You have done a good job with the flours! Such a classic recipe and you have made it so well. I am so tempted to make some soon. Looks fabulous!